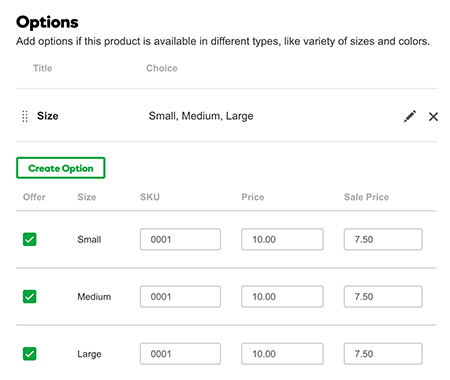 Add a list of choices for a product if you are offering options like colors or sizes. Note: This article is for the standalone version of Online Store. It doesn't apply to the GoCentral version. In your Online Store, on the Products menu, click Products. Click the name of the product you want to update. 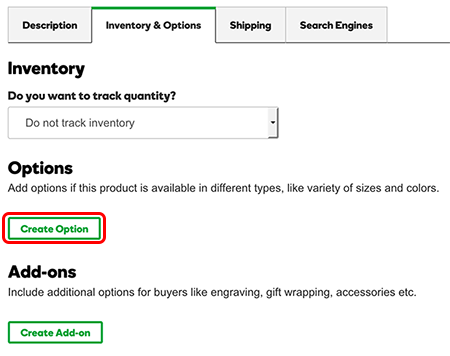 On the product page, click the Inventory & Options tab, and in the Options section click Create Option. Type the option title (for example, Size or Color). Once you create your first few options, those choices appear automatically in the menu. In the Choice box, type the first choice. For example, if the title is "Size," type "Medium". To add more choices for this option, click CREATE OPTION CHOICE and repeat the previous step. If you want to change the order of the choices, click the dotted area next to the Choice box and drag the box to the order you want. Click Done when you've added all the choices you want to offer for this option. Click and drag dotted area at front of each choice or option Reorders the list of choices for an option. Click the pencil icon Add another choice for the option, or edit choices you've already added. Click the X Deletes the choice after displaying a confirmation alert. Enter the SKU, Price, and (optional) Sale Price for each option. 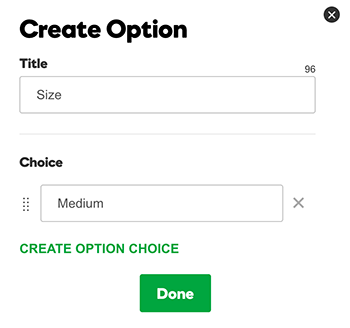 Note: You can create up to 100 option choices (known as "option values") for all your products store wide. But you can only track inventory for three of those option values. For example, you could track inventory for a shirt's color, size, and sleeve length, but if you add another option value, you must choose which three options to track. Click View Store in the upper right corner, and then click the product page to see your changes.